I am not sure why this recipe hit our radar, but I am glad it did. The flavors combine in a delectably tangy and creamy way, each complementing the other and bringing out the best elements. I am definitely on a poached egg kick– I put them on everything– but this recipe tops my list right now. Cook rice in a large pot of boiling salted water until tender, 45-50 minutes. Drain rice, return to pot, cover, and let sit 10 minutes. Spread out on a baking sheet and let cool completely. Purée kale, oil, and 1 tablespoon water in a food processor until smooth; season with kosher salt and pepper. Meanwhile, bring 2 inches of water to a boil in a large saucepan; remove from heat Crack an egg into a small bowl, then gently slide egg into water. Repeat with remaining eggs, waiting until whites are opaque before adding the next. Cover and poach for 4 minutes. Using a slotted spoon, transfer eggs to paper towels as they are done. Toss radish with 1 tablespoon lemon juice in a small bowl; season with kosher salt. Toss rice, preserved lemon, 1 tablespoon dill, remaining 1 tablespoon lemon juice, and 1/3 cup kale pesto in a medium bowl; season with kosher salt and pepper and mix in more kale pesto, if desired. 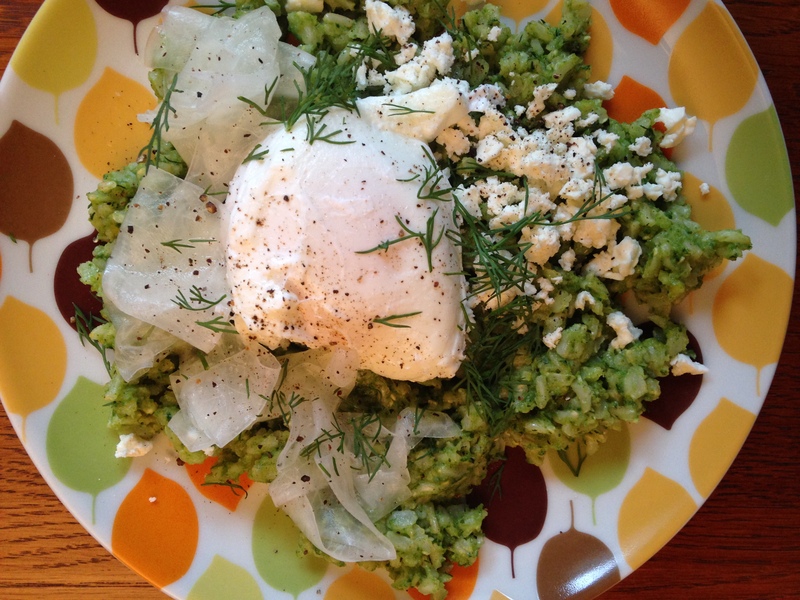 Serve kale pesto rice topped with poached eggs, radish, feta, hot sauce, more dill, and sea salt.